H x W x D: 21 in. / 18 in. / 11 in. President Truman, a former Army Field Artillery officer and World War I veteran, was a member of The Army and Navy Club. 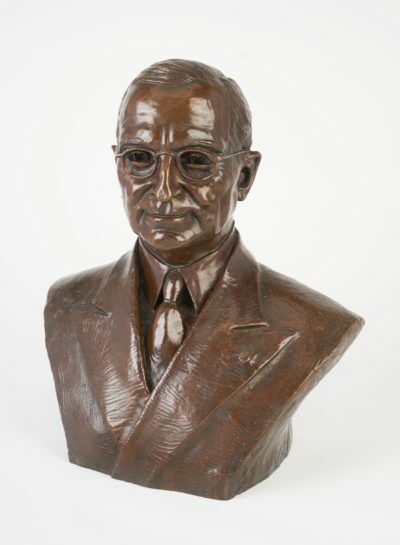 Felix de Weldon sculpted this bust in 1945 in the White House, where President Truman sat for the sculpting sessions. The original is now in the Truman Memorial Library in Independence, Missouri. This bust was cast under de Weldon’s supervision and is one of only two known copies. A longtime Club member, de Weldon served as the Club’s Fine Arts consultant during the 1984-1987 rebuilding and donated many of his own works to the Club.